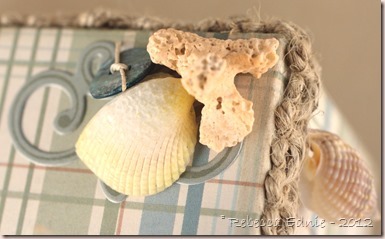 Love the colors and shells – the trim is fabulous!! Congrats on your shout out at WM this is beautiful! I love the soft blue, the shells, and all the perfect embellishments – a beautiful way to treasure things that are important to you! 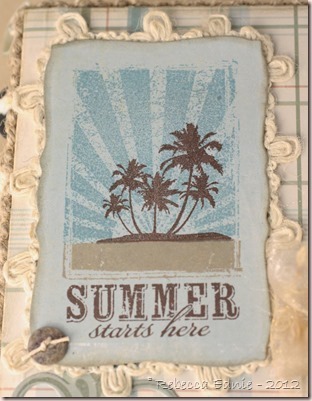 The blues on your card is beautiful and so summery! 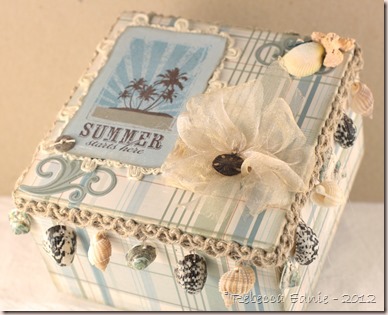 Love the box with a bit of shells. Oh, I like the stripes too. Rebecca, what a beautiful box! Love all the details, it's a wonderful summer prohject!! Great take on the challenge. I do like all the pretty embellishment with the shells and charms. This is so pretty! I love the box you made, the colors are just beautiful and the shells are perfect!Chris L.
Rebecca this is pretty amazing! 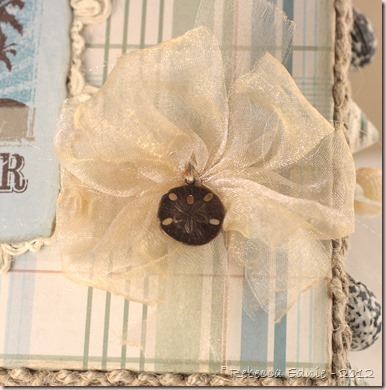 I'm soaking up all your tips about bow tying and the airbrushing, and I do love the shell trim, it's perfect for this box, but most of all, I LOVE that little island stamping, those colours are stunning, a box to treasure! Thank you so much for playing along with us! 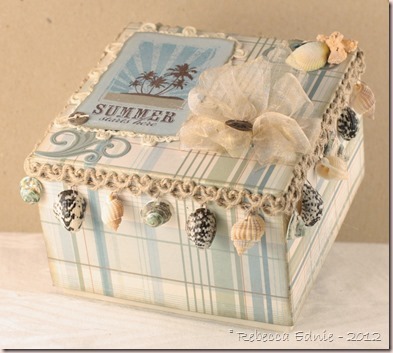 Love your beach box – that blue plaid paper is perfect and your stamped panel is colored wonderfully! love all the fibers and shells! This is absolutely STUNNING!! Love the vintage feel to it. Absolutely gorgeous. What a beautiful box! 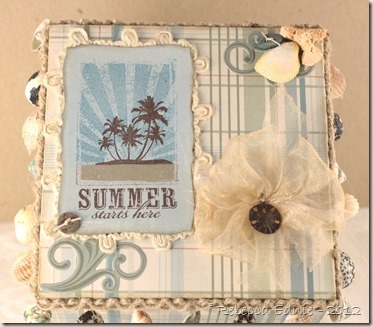 I love all the beachy elements from the shells to the lovely blues you used in your stamped image! !